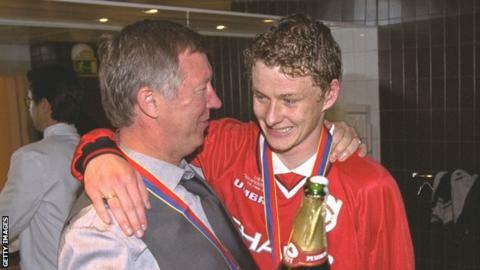 Man Utd appoint Solskjaer: Can you name 1999 Champions League final team? Ole Gunnar Solskjaer has been appointed interim manager of Manchester United until the end of the season, replacing Jose Mourinho, who was sacked on Tuesday. Solskjaer, 45, scored 126 goals for United in 11 seasons as a player at Old Trafford, between 1996 and 2007. He famously came off the bench to score a 93rd-minute winning goal in the 1999 Champions League final. But can you name the starting XI and seven substitutes for that game against Bayern Munich in Barcelona. Can you name the Manchester United starting XI and substitutes for the 1999 Champions League final?